Eloquii also recently launched another capsule for their much anticipated Draper James collection. I of course, have this thing with pink, so I couldn’t resist this light pink scallop edge coat from the collection. Let’s talk about some of the trends like this windowpane print pant and my personal favorite for this season, leopard print skirt! The white bodysuit is also a must have for this season as well. Whether you are wearing it under your suit jacket or tucked into a skirt, with a pricetag of under $30, this is one essential you must get! You can shop some of my favorites below from their latest arrivals. Let me know what you’re loving and what you would like to see more of! 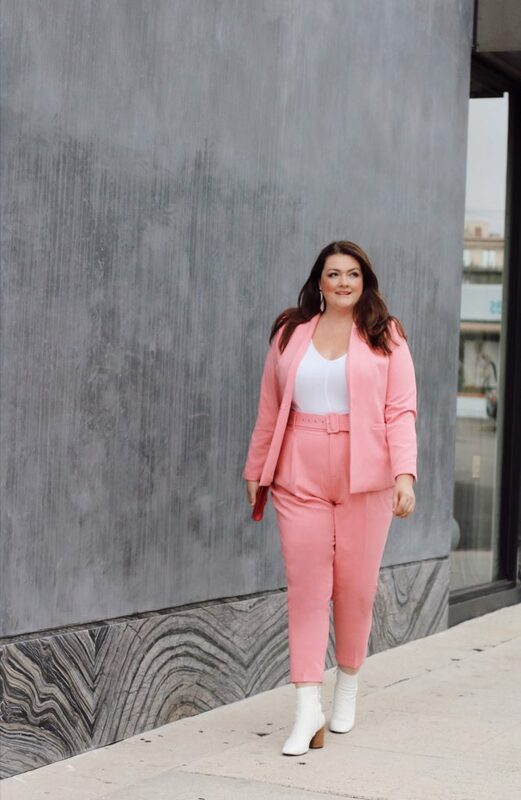 OMG this pink suit is everything! I love the color on you – how fun!! !